Sidney’s Samantha Reynolds shoots as Troy’s Payton Riley defends during a Greater Western Ohio Conference American North Division game on Wednesday in Troy. Reynolds led Sidney with 13 points. Sidney's Emma Wiford shoots as Troy's Tia Bass defends during a Greater Western Ohio Conference American North Division game on Wednesday in Troy. Sidney's Hallie Truesdale passes as Troy's Morgan Kaiser defends during a Greater Western Ohio Conference American North Division game on Wednesday in Troy. Sidney's Samantha Reynolds shoots as Troy's Makenna Tylor defends during a Greater Western Ohio Conference American North Division game on Wednesday in Troy. Sidney’s Kelsey Kizer passes while covered by Troy’s Laura Borchers during a Greater Western Ohio Conference American North Division game on Wednesday in Troy. Sidney's Kelsey Kizer eyes the ball as Troy's Erika Innes defends during a Greater Western Ohio Conference American North Division game on Wednesday in Troy. 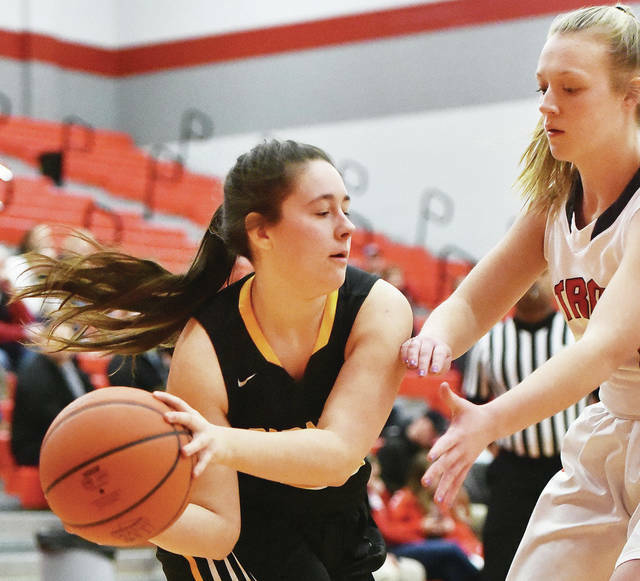 Sidney's Emma Wiford shoots as Troy's Payton Riley defends during a Greater Western Ohio Conference American North Division game on Wednesday in Troy. 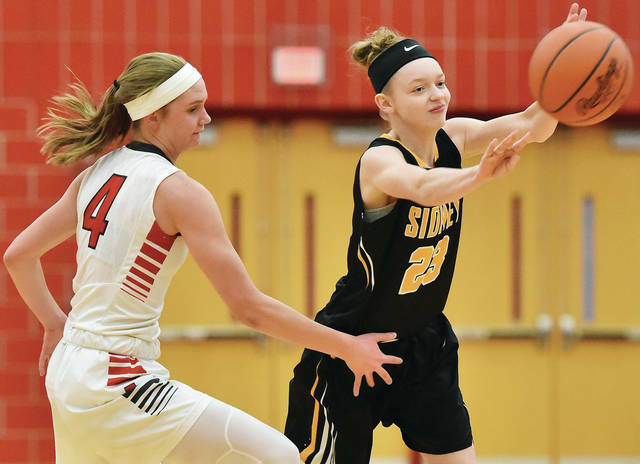 Sidney's Alina Kindle looks to get past Troy's Morgan Kaiser during a Greater Western Ohio Conference American North Division game on Wednesday in Troy. Sidney's Samantha Reynolds and Troy's Payton Riley reaches for a rebound during a Greater Western Ohio Conference American North Division game on Wednesday in Troy. Sidney's Allie Herrick passes as Troy's Madison Burton defends during a Greater Western Ohio Conference American North Division game on Wednesday in Troy. 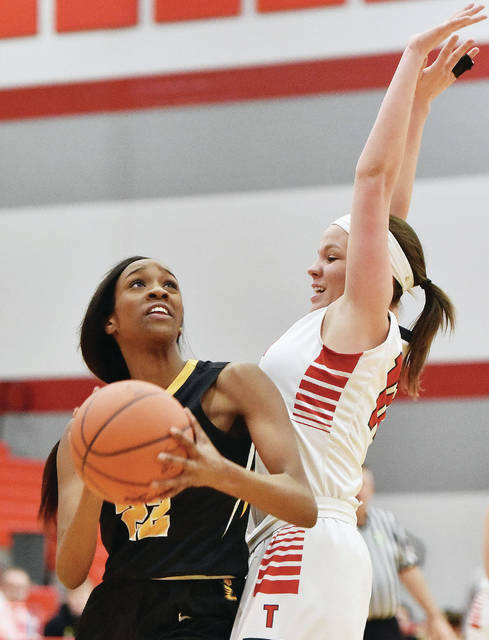 Sidney's Keliyah Marcus looks to pass as Troy's Madison Burton defends during a Greater Western Ohio Conference American North Division game on Wednesday in Troy. 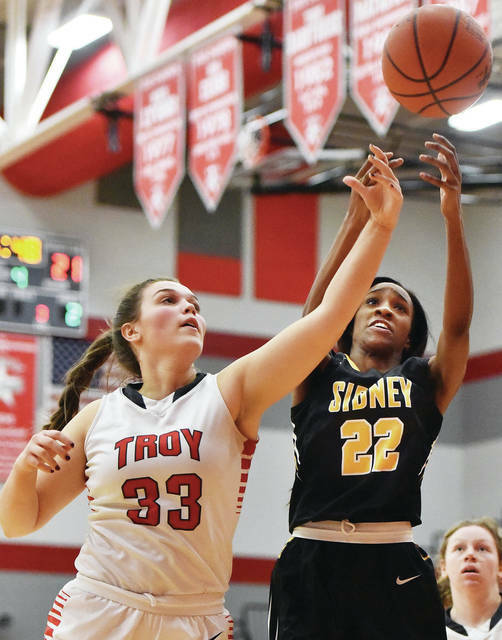 View more photos of Sidney at Troy girls basketball here. TROY — MaKenna Taylor hit four of the Troy’s five third-quarter 3-pointers as Troy tinkered with its tried-and-true formula against a Sidney team that has also improved since the first meeting between the two rivals, turning what was a four-point game late in the first quarter into a 28-point rout in a 54-26 Greater Western Ohio Conference American North Division victory Wednesday night at the Trojan Activities Center. With the win, Troy improved to 12-5 overall — equaling last year’s win total, which was already the most wins in a year since the team won 14 games in the 2011-12 season — and remained in second place in the GWOC American North at 9-3, two games behind division leader Tippecanoe. And taking on Sidney, which fell to 0-18 and 0-12 in the division, the Trojans saw an opportunity to build on what they’ve already done and try some new things — but the Yellow Jackets were also a different team than the first meeting, when Troy only allowed eight points after three quarters in a 56-22 win back on Dec. 5. The Jackets kept pace with Troy early on, scoring more in the first quarter Wednesday than in the first three quarters in that first meeting, with a jumper by Sam Reynolds cutting Troy’s lead to 13-9 late in the first quarter. But Morgan Kaiser got the ball inside to Tia Bass for an easy basket and MaKenna Taylor hit Kaiser for an open jumper to give Troy some separation after one at 17-9. Troy continued to pull away in the second quarter despite Bass having to sit down with foul trouble. After another bucket by Reynolds cut the lead to five at 17-12, MaKenna Taylor hit a 3 and Macie Taylor scored six of her game-high 18 points in the quarter, helping the Trojans build a 28-14 halftime lead. And in the third, all of the new things that Troy was trying began to work. MaKenna Taylor hit a 3 then set up a 3 by Macie Taylor to start the quarter quick, then Bass kicked out to MaKenna Taylor for another 3 to make the score 37-14 and force a timeout by Sidney with 6:12 still remaining in the third. Bass then scored in the paint before picking up her third foul, but then her replacement Payton Riley kicked out to MaKenna Taylor for yet another 3, Kaiser found MaKenna Taylor open for her fourth and final 3 of the quarter and Macie Taylor then hit MaKenna Taylor for a fast-break finish to make the score 47-14 before Sidney final scored again, capping off a 23-0 run by the Trojans. 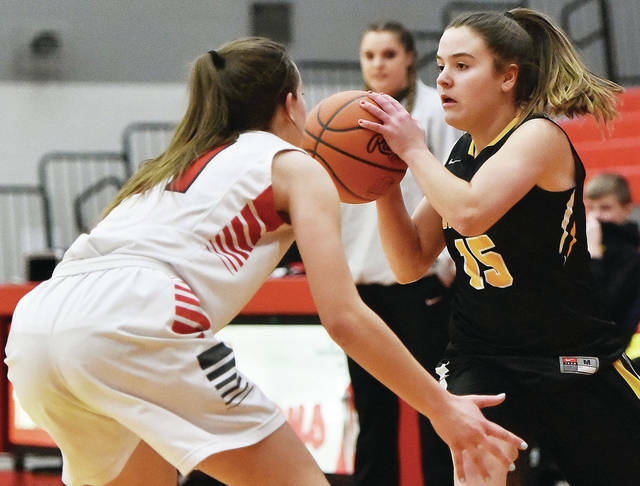 “We came out in the third quarter, and that was something new we put in with the inside-out ball movement and Tia kicking it out to shooters,” Troy coach Aaron Johnson said. “MaKenna had four 3s, and it was good to see that kind of explosion. We’re preaching the inside-out game against the zone, and I think Tia is able to draw so much attention that she’s able to look and find shooters. Troy led 51-18 after the third, having pulled its starters out with 1:30 left in the quarter, and the Trojan backups closed out the win in the fourth. 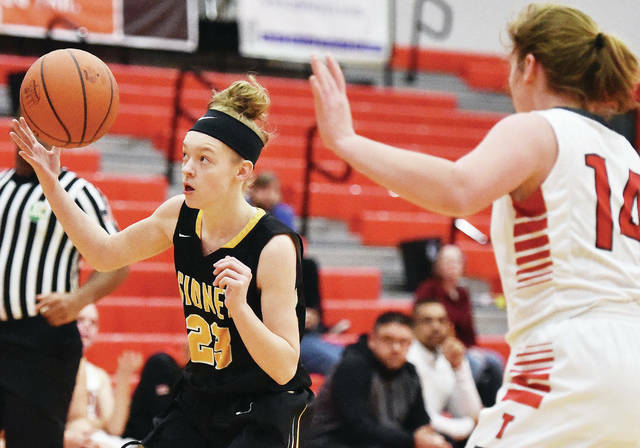 Macie Taylor, the GWOC’s second-leading scorer, led the way with 18 points and two assists, while MaKenna Taylor scored a career-high 18 points while dishing out five assists and Bass added eight points, five rebounds and three assists. 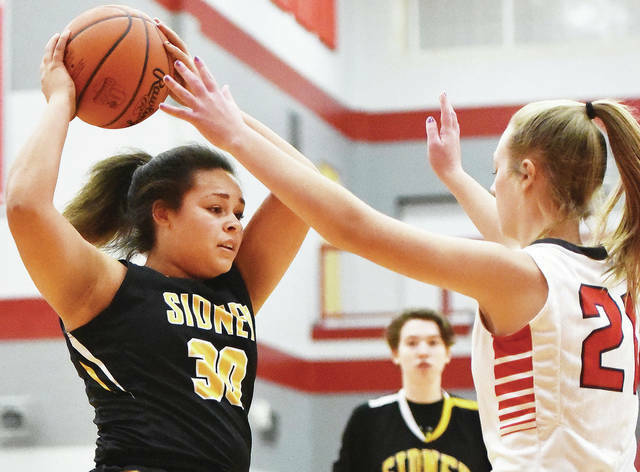 Reynolds led Sidney with 13 points and five rebounds, Cassidy Truesdale had four points, Kelsey Kizer and Emma Wiford each had three points, Hallie Truesdale scored two and Ranaya Conrad had one. 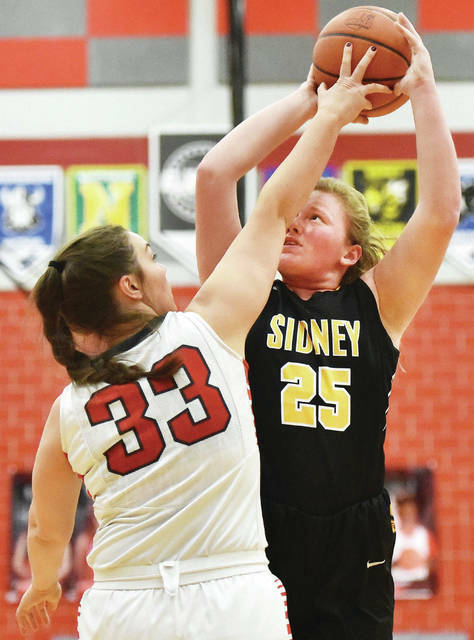 Sidney will try for its first win of the season on Saturday at home against archrival Piqua. Sidney’s Emma Wiford shoots as Troy’s Tia Bass defends during a Greater Western Ohio Conference American North Division game on Wednesday in Troy. Sidney’s Hallie Truesdale passes as Troy’s Morgan Kaiser defends during a Greater Western Ohio Conference American North Division game on Wednesday in Troy. Sidney’s Samantha Reynolds shoots as Troy’s Makenna Tylor defends during a Greater Western Ohio Conference American North Division game on Wednesday in Troy. Sidney’s Kelsey Kizer eyes the ball as Troy’s Erika Innes defends during a Greater Western Ohio Conference American North Division game on Wednesday in Troy. 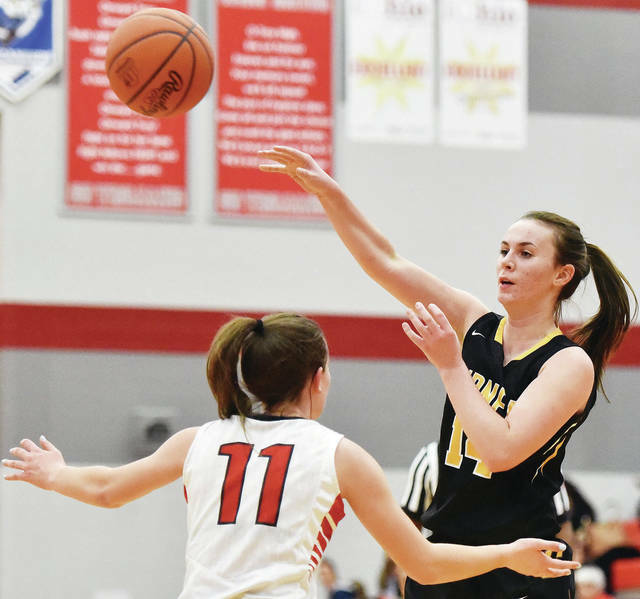 Sidney’s Emma Wiford shoots as Troy’s Payton Riley defends during a Greater Western Ohio Conference American North Division game on Wednesday in Troy. 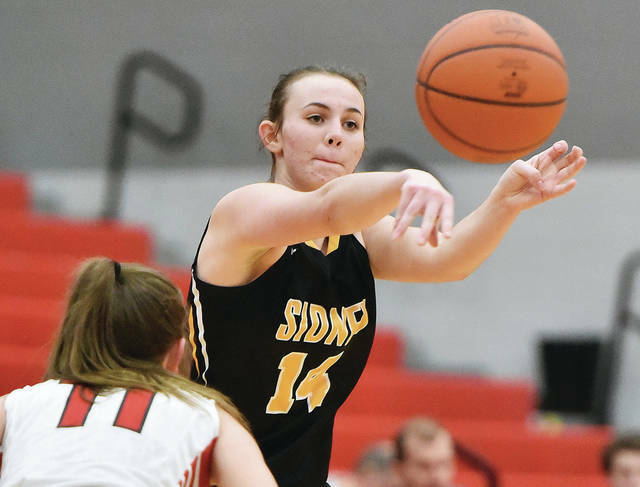 Sidney’s Alina Kindle looks to get past Troy’s Morgan Kaiser during a Greater Western Ohio Conference American North Division game on Wednesday in Troy. 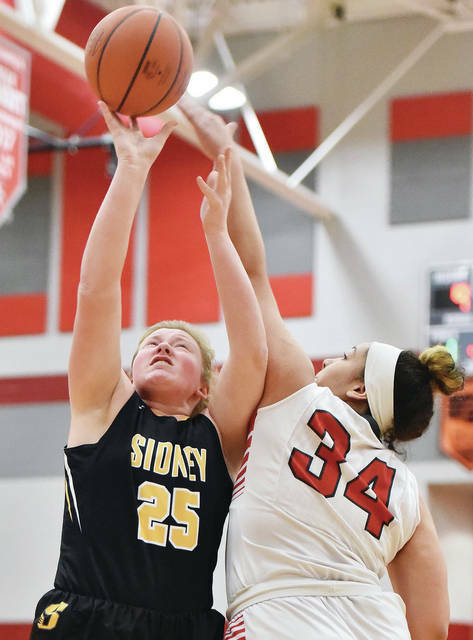 Sidney’s Samantha Reynolds and Troy’s Payton Riley reaches for a rebound during a Greater Western Ohio Conference American North Division game on Wednesday in Troy. Sidney’s Allie Herrick passes as Troy’s Madison Burton defends during a Greater Western Ohio Conference American North Division game on Wednesday in Troy. 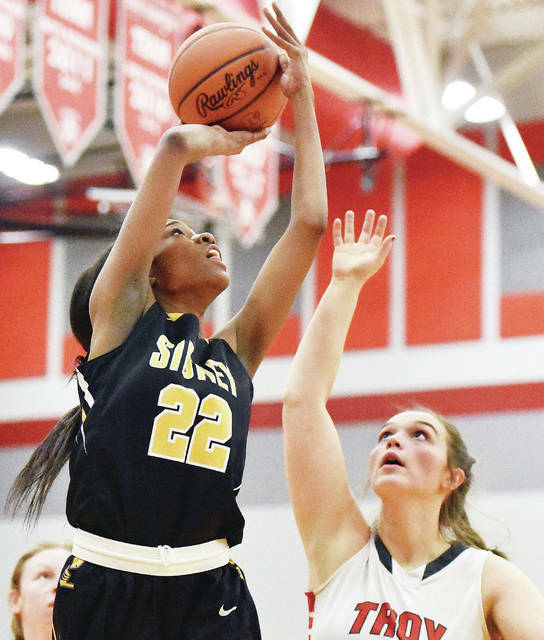 Sidney’s Keliyah Marcus looks to pass as Troy’s Madison Burton defends during a Greater Western Ohio Conference American North Division game on Wednesday in Troy.